Two-piece size matched jacket and pant. Waterproof, PVC coated polyester shell. 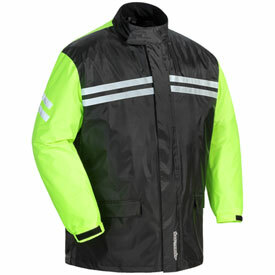 Full-length nylon two-way zipper and hook-andloop closure on jacket. Brushed lining on the collar for improved comfort. Hook-and-loop elasticized adjustable jacket cuffs. Adjustable shock cord hem on jacket. Mesh lining in the body of the jacket and upper portion of the pant leg. Two large front pockets on the jacket. Reflective tape across the chest, back, and upper arms of jacket and cuffs of pants. Breathable vents on back and underarms of jacket.